In 1966, the Jackson 5 won an important local talent competition with a Michael-led rendition of the Temptations' "My Girl." Their father, who had been chauffeuring them to out-of-state performances, also booked their first paid professional gigs that year. In 1967, the group won an amateur talent competition at Harlem's legendary Apollo Theater, where they earned an influential fan in Gladys Knight(probably the first person to recommend the group to Motown). At the end of the year, the Jackson 5 made their first studio recordings for the small Gary-based Steeltown label, and their single "Big Boy" became something of a local hit. Championed again to Motown by Bobby Taylor, a member of the Vancouvers who'd seen the group in Chicago, and Diana Ross, the Jackson 5 finally got a chance to audition for the label in the summer of 1968. Desperately needing new blood, an impressed Berry Gordy signed the group and flew them out to his new headquarters in Los Angeles, where he and his assistants groomed them to be the label's next breakout stars. Having lost his famed Holland-Dozier-Holland songwriting team, Gordy formed a new partnership with Freddie Perren, Fonce Mizell, and Deke Richards dubbed the Corporation, which set about crafting material for the group. In August 1969, shortly before Michael turned 11, the Jackson 5 opened for Diana Ross at the L.A. Forum, and in December, they issued their debut album, Diana Ross Presents the Jackson 5. On October 7, 1969, the Jackson 5 released their first single, "I Want You Back," a Corporationcomposition that had originally been intended for Gladys Knight. It was an instant smash, hitting number one on both the pop and R&B charts. So did their next two singles, "ABC" and "The Love You Save" (both from their second album, ABC), which solidified the group's so-called bubblegum-soul sound and certified them as pop sensations. Third Album was released before year's end, spawning the hit ballad "I'll Be There," which not only proved that the group (and lead singer Michael) were more mature and versatile than their bright, bouncy initial singles let on, but also made them the first group in pop history to have their first four singles hit number one. It also became the best-selling single in Motown history, spending a stellar five weeks at number one. And it had still been less than a year since the group's national debut. In the meantime, the fantastically hyped Jackson 5 craze was beginning to cool down. Their prolific LP release schedule slowed a bit, and while their singles continued to perform reliably well on the R&B charts, they were no longer a sure-fire bet for the pop Top Ten. After a relatively lengthy drought, the Jackson 5 scored what would be their last major smash for Motown, the 1974 number two hit "Dancing Machine," a nod to the emerging sound of disco (it also topped the R&B charts). The group's frustrations with Motown had been building -- not only did the label seem less interested in their career, but they still refused to allow the Jacksons to write or choose their own material, or play their own instruments on their records. Finally, in early 1976, they left Motown to sign with Epic. 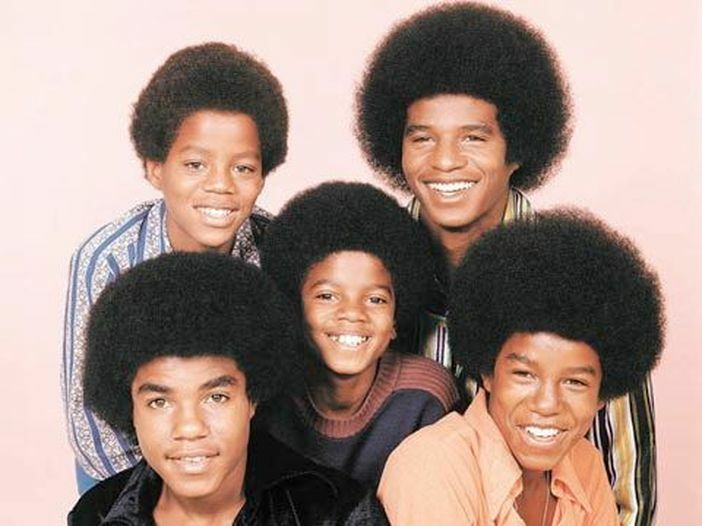 When the legal battles finally ended, Motown won a breach-of-contract settlement and retained rights to the Jackson 5name, forcing the group to become the Jacksons. They also lost Jermaine, whose marriage to Berry Gordy's daughter Hazel made it extremely impractical for him to join his brothers. He was replaced by younger brother Randy (born Steven Randall Jackson, October 29, 1961), who had been appearing (unofficially) with the group as a percussionist for some time. So today, with easy A's all around, I choose The Jackson 5's "ABC" as my, c'mon get happy, smile like you have a secret, it's easy if you let it, song for a, break out of the gray, shake out the sillies, open up and laugh, Thursday.